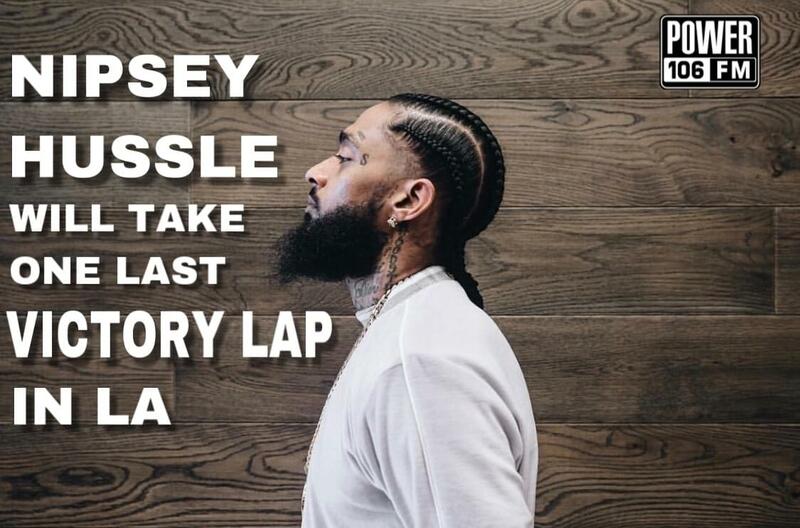 **Nipsey Hussle to Be Honored With Memorial at Staples Center, Followed by 25-Mile Procession. Nipsey Hussle will be getting a hero’s send-off after he was killed on March 31 in South Los Angeles. The procession will be for 90 minutes, and it’ll end at a Crenshaw-area funeral home. After Hussle’s slaying, police identified a man named Eric Holder as a suspect and quickly arrested him. Since Hussle’s death, the outpouring has been huge and ongoing. On top of that, his music has been a mainstay on Los Angeles radio stations and his last album “Victory Lap” just hit the No. 2 position on Billboard. The LP peaked at No. 4 after its February 2018 release.